"A 'yellow octopus' kite glares down on unsuspecting kite festival goers, as if to attempt to frighten them." Artist comment: "At the kite festival on the beach recently, some of the most interesting kites I saw were octopus kites. Although technically they are more like wind socks, never-the-less they were a delight to see. 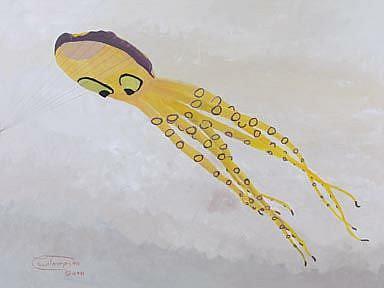 For this yellow octopus, I chose oil on an 18" X 24" canvas. To compliment the yellow, I painted a warm grey background, then the octopus, and finished with the details of eyes and 'sucker', and finally finishing by drawing the kite lines. This kite is designed by New Zealander Peter Lynn and is distributed by Oregons's Gomberg Kites."